Comprehensive health center at Metropolitan Hospital aims to remove barriers to care for underserved lesbian, gay, bisexual and transgender populations. (l-r)Medical Dir. of Metropolitan Hospital Comprehensive LGBT Health Center Dr. Nadia Duvilaire; Patient Christopher Leo Daniels; HHC President Dr. Ram Raju at the launch of the hospital's Comprehensive LGBT Health Center. Christopher Leo Daniels, who lives in Upper Manhattan, is one of many New Yorkers who avoid doctors and hospitals not because he lacks insurance, but out of fear of disrespect and discrimination by healthcare providers. Christopher is one of many lesbian, gay, bisexual and transgender (LGBT) adults who often face significant challenges in securing adequate healthcare, and delay medical care and limit information they share with healthcare providers. 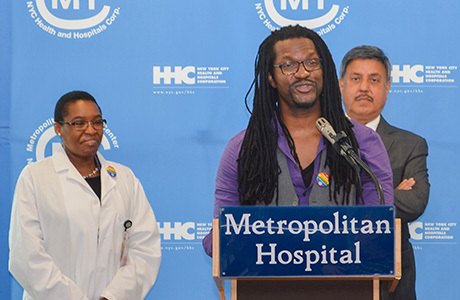 Comprehensive LGBT Health Center at HHC’s Metropolitan Hospital to provide primary, preventive and specialty care by a team of professionals who are specially trained to manage the health care needs of the LGBT community. HHC officials said this specialized clinic will provide an environment where patients feel welcome and comfortable. “Our team is committed to providing comprehensive and inclusive services that address the physical and mental health needs of all of our patients with sensitivity and respect,” Metropolitan Hospital Executive Director Meryl Weinberg. “We have already been designated as a leader in LGBT healthcare, which makes us uniquely qualified to provide these services to the LGBT patients we already serve, as well as to our staff and the larger community,” added Weinberg. The hospital was designated as a "Leader in LGBT Healthcare Equality” by the Human Rights Campaign (HRC) last year and has earned top marks for its commitment to equitable, inclusive care for LGBT patients and their families. Finally, Christopher has a medical home. “The staff at Metropolitan erased any anxiety and concerns I had, and were supportive from the time I arrived to the time I left,” he said. The new LGBT health center will be staffed by primary care physicians, nurses, health educators, patient advocates, and other healthcare professionals who have been working across disciplines, and in conjunction with community based organizations and patients, to ensure that the center meets the needs of LGBT patients. Services include men’s health, OB/GYN and women's health, trans/affirmative care, senior health, HIV screening and treatment, infectious disease risk reduction and prevention, family planning, specialty immunizations, addiction counseling and rehabilitation services, behavioral health services, community-specific support groups, art therapy groups, referrals and other specialty service linkages, as well as LGBT cultural competence organizational training. Dr. Raju noted that the new clinic will serve as center of excellence to share best practices and spread understanding across the system . “Our goal is to reduce barriers to healthcare so all New Yorkers can access the health services they need at any point of care in our system and without hesitation,” he said. 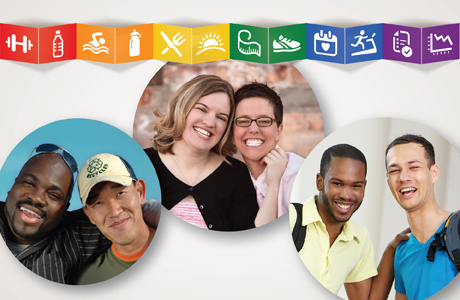 In 2011, HHC became the first public healthcare system in the United States to mandate an LGBT Cultural Competence Training program for staff. Part of the training included a video “To Treat Me, You Have to Know Who I Am,” to help staff better understand LGBT patients to improve access to healthcare and help reduce health disparities related to sexual orientation and gender identification. HHC continues to offer staff training sessions to secure the Human Rights Campaign's (HRC) designation "Leader in LGBT Healthcare Equality” for other hospitals and health centers in the system. The Metropolitan Hospital Comprehensive LGBT Health Center is located at 1901 First Avenue at 97th Street, 4th Floor. It is open Saturdays, from 9 AM to 5 PM, by appointment only. To schedule an appointment or speak with a member of the LGBT Health Center staff, patients and families can contact 212-423-7292 or metlgbt@nychhc.org. “For the first time, I felt truly cared for in a medical setting. I felt respected and was treated as a collaborator in my own healthcare,” said Christopher.